A while back, we wrote about the top food experiences we’ve had, which included everything from tapas bars to airport bars, funky pubs to no-frills street food. What that list didn’t include (with one exception) were upscale restaurants. Now, we don’t spend our travel dollars lightly, believing that a great experience–sometimes the best ones, in fact–can be had at any price. But, every now and then, we do splurge on a really special meal. The places listed below would be considered “splurge” restaurants by most people, including us. But what they also have in common is that, no matter the price, the food (and corresponding experience) was worth the splurge. A couple of tips for indulging in a splurge restaurant on a budget: go at lunch on a weekday, when the prices are often lower and/or a special prix fixe menu is offered, or sit at the bar where you could share a couple of apps or a main dish without feeling out of place. Roast, London: Situated above and overlooking Borough Market on the South Bank, Roast features local and seasonal produce, meats, cheeses and even wine. We had a fantastic lunch here in 2007 – lunch prices are a bit more reasonable – and still remember it as one of the best meals we’ve ever had, anywhere. August, New Orleans: Visited a year ago, when we were there for Jazz Fest. 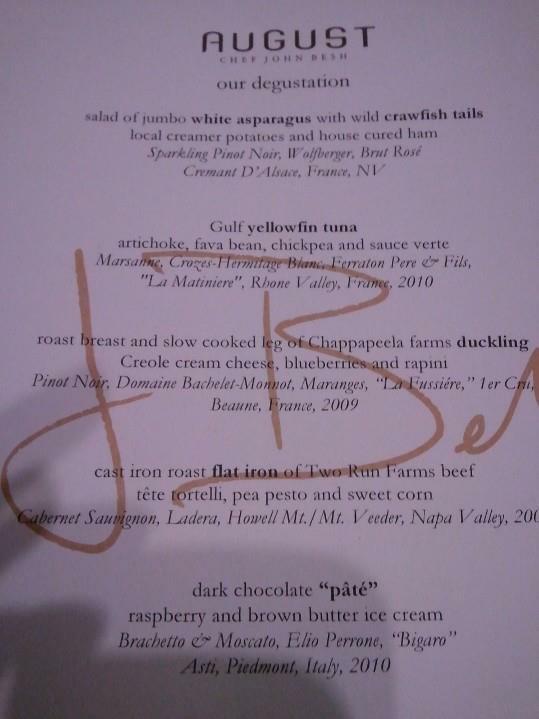 I had been wanting to try this John Besh restaurant for a while, and we decided to do the tasting menu. The caliber of the food we were served, as well as the impeccable service, made this dinner actually a great value. Bayona, New Orleans: The most recently visited place on this list, written about here. Fore Street, Portland, ME: Living as we do in Boston, we go to Portland quite often. However, we went to Fore Street for the first time just recently. We had a late reservation but ended up arriving early, and found seats at the (very lovely) bar. Had fantastic service and an even better meal. Definitely a “special occasion” restaurant. Veeraswamy, London: This was our first real “splurge” meal on a vacation – our second time in London, the year after we got married. We had never tasted such good Indian food in such a regal setting. Of course, London has a lot of great Indian food at all price ranges, but we’d definitely go back to this place for a special occasion. U Zlate Studne, Prague, Czech Republic: Our one splurge meal while visiting Prague a few years ago, this restaurant is on the hill near the castle, a little hard to find and tucked away on a side street, but with absolutely spectacular views overlooking the city. 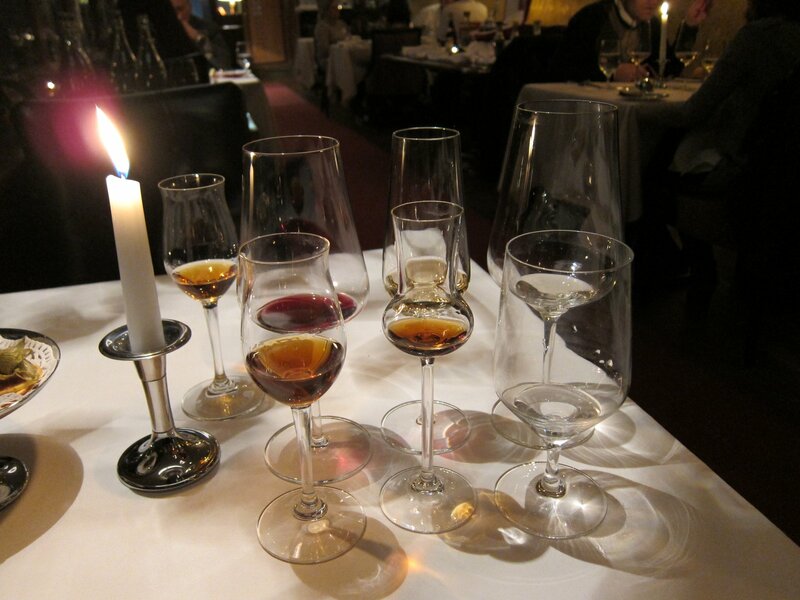 They had an eight-course degustation menu with wine pairings, which featured local specialties and primarily Czech wine (although the first course was a French champagne). Everything was interesting and delicious, and a standout which we still remember was the pate de foie gras dusted in cocoa powder. (I know, it sounds really odd, but it was probably the best single bite and wine pairing of the night). Have you had a really fantastic splurge meal somewhere? Share it in the comments. Our most recent ” splurge” dinner was for my husband’s 60th birthday. The restaurant was the Oxford House Inn in Fryeburg, Maine. Both the ambiance, the service and the food were exceptional. My Bibb salad with grilled shallots, grapes and walnuts was a work of art. Both of our filet mignons were done perfectly. My husband’s oysters Rockefeller were delightful. The bill was at least double what we would ordinarily spend on a dinner out, but it was really worth every penny. We will definitely make it our ” special occasion ” place. I love finding a gem like that in an unexpected or out of the way place. Definitely a keeper!